As is the case for all painters, looking for opportunities to exhibit your work approximates the oxygen requirement of your body. If nobody sees, nobody gives feedback, encouragement, direction, useful (or not) criticism, and of course, nobody buys. It would be an interesting exploration to hear the stories of how those of us who "hang out" at FCA got into the various galleries we are associated with, how it helped, changed our course, provided unthought-of opportunities, etc. Recent developments in my corner of the painting universe came as a result of an art gallery connection. I have three galleries currently handling my work, both originals and giclee prints. 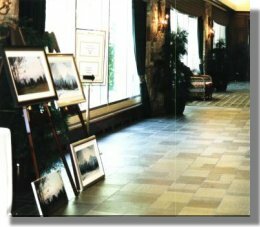 I have participated in Artist Walk style painting demos in all three. One of these was at the Charisma Gallery in Abbotsford. Having at least one Gallery Owner enthused not only about your work, but what hopefully lies ahead for you, is worth its weight in gold. Rod Bishop, at Charisma Gallery, expressed just such an interest in my work early this September, when he put my name forward for a major commissions. 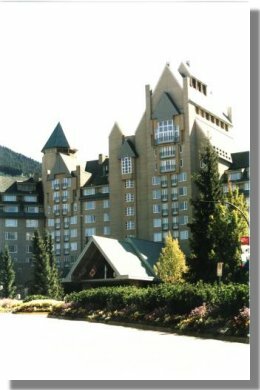 There was to be a conference at Whistler later in September, of the largest credit unions in Canada and the USA. The organizers of the conference approached Rod, looking for an artist who could create a commemorative painting over the course of the four days of the conference. 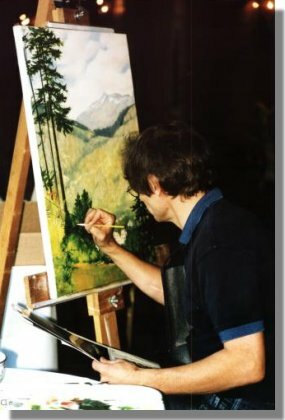 It was to be painted in the Chateau Whistler, so that the delegates would be able to watch the development of the work. At the conclusion the conference, the original would be reproduced into 35 giglee prints on canvas, one for each of them. The Whistler project began at Charisma gallery in Abbotsford. 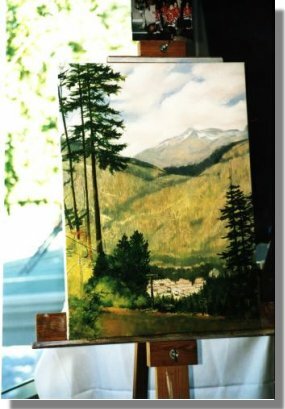 Gallery owner, Rod Bishop had put the idea to me to do some paintings of Mount Baker, and was impressed by the first two Baker images painted in the summer of 2002.these are half of an eventual four-part series. 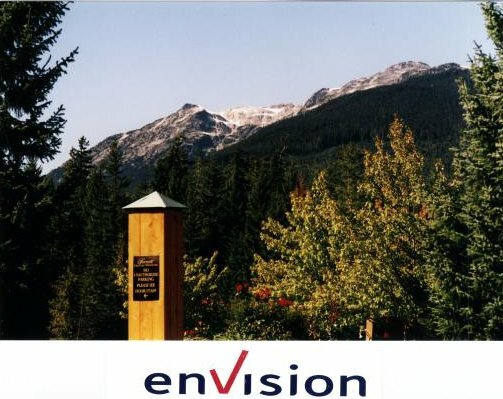 When Gord Huston, CEO of Envision, contacted Rod about finding an artist to produce a commemorative painting for the delegates of their upcoming large credit union conference in Whistler, my name was put forward. Gord had the opportunity to view my work at Charisma Gallery, and the decision was made to move ahead with me as the artist. Rod wanted to know if I might be interested. I met the organizers on Wednesday evening before the start of the event, where they selected the image they wanted for the painting. Anticipating typical BC weather, I had zipped up to Whistler the weekend before to hopefully scout out suitable scenes and get familiar with the feel the place. Given a lousy letter on Wednesday and Thursday of the conference, it turned out to have been good idea. I was asked to paint a 20x28 acrylic painting of a scene which would be typical of what the delegates would see. After this meeting, I went directly up to our room (they put us up in the Chateau Whistler, all expenses paid) and roughed out a full-size sketch, made my palette choices, organized my materials, prayed for a miracle, and went to sleep. Over the next three days, the painting came together without major setbacks or obstacles. My wife Carol was crucial for the success of the project, for at least a dozen reasons, chief among them keeping me on a level footing. The the delegates got to choose the mats and frames for their eventual print, so while I painted in the lobby of the Chateau, Carol looked after these details, as well as deflecting questions which really didn't need me to answer. We also had a small exhibition of recent work there... the opportunity of having hundreds of people per day see your stuff was not to be missed! The organizers asked me to remain anonymous for the Thursday, so that as the delegates were arriving, they would not know that we were connected to their event. The questions by Edward deflected with a polite "We've been commissioned to do a painting here at the Chateau." Period. Thursday evening, as the delegates had their welcoming cocktails and opening remarks, we schmoozed among them, in an overtly misplaced passionately could muster. As a prearranged gag, we "hammed it up to the max," to the dismay of onlookers, who were elbowing each other with "who let those two in?" all over their faces. I was then introduced and the project explained. The delegates were obviously thrilled with the concept, and over the next three days became increasingly keen as the painting evolved. Of course, all I had to do was "nail" the painting. On Thursday morning, I roughed in the sketch on the canvas while still in the safety of the hotel room. The sky took shape over a couple of hours, and we were ready to set up to paint and exhibit in the hotel lobby. 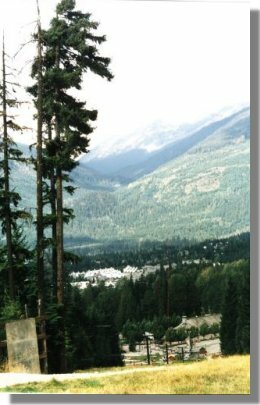 The vantage point for the image is from a 10 minute walk up Blackcomb from the Chateau, looking south, down into the Village, then up again to Rainbow Mountain. Hence the title "Up and Down at Whistler." 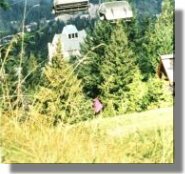 I opted for the more interesting foreground of the picture on the left, and the sunlight on the mountain behind the village in the picture below. 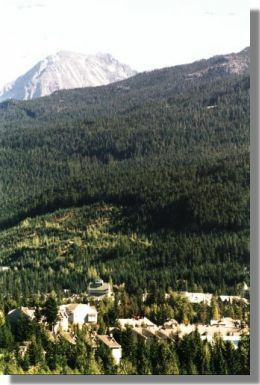 Upper Village at Whistler, with the Fairmont Chateau in the bottom left corner. 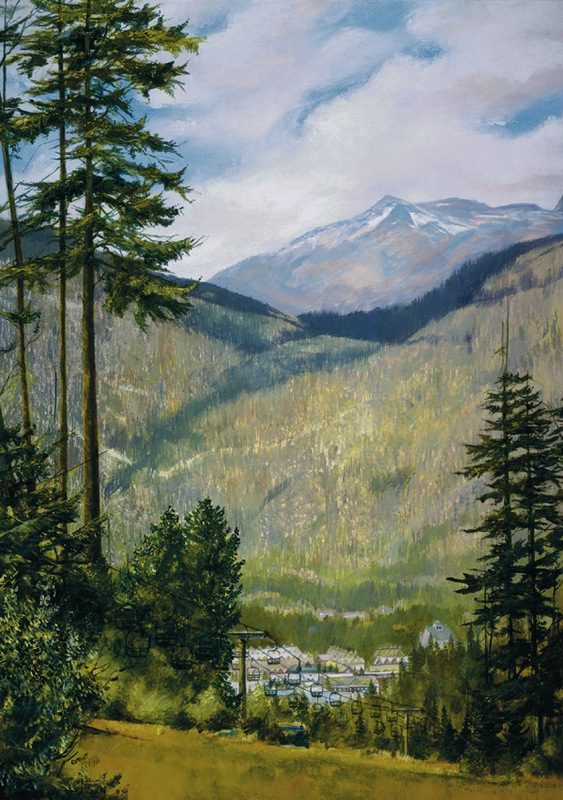 The project began with a meeting in the organizers of the Large Credit Union Conference at 4 p.m., when they chose the view of Whistler for the painting. They wanted a 20 by 28 size original, the bridge over the next three days of their conference, then reproduced in limited edition for each of the delegates. We were booked into the Chateau from September 18 to 21. Following the Wednesday afternoon meeting with the conference organizers, I went back to our room and sketched out the full-sized rough painting. I chose a limited palette, did the color sketch, prayed for help, and went to bed. As the conference was taking place in the Chateau, having the structure in the painting seemed like a good idea (duhh), but it was hidden a bit by the right hand side of the tree forms above; one of the advantages that painting has over photography is the ability to put things anywhere you feel like. The light in the foyer of the Chateau was hard to complain about; floor to ceiling glass with a southern exposure. Interestingly, when I took the reference photos the week earlier, so many of them seemed to come back to a variety of views of Rainbow Mountain. I really had no idea that the exact spot I was to be located located in the chateau would have a direct view of Rainbow. It was sort of indoor plein aire painting. Also of interest were the many other conference attendees, apparently medical, legal and otherwise; over the course of the three days of painting, comments from observers became increasingly supportive, as if encouraging someone through the last leg of a marathon. There were occasional moments of quiet, but mostly there were herds of various conference delegates, moving in waves from place to place. When asked if this proved a distraction, my usual reply was, "We have active kids ..." An unexpected distraction however was people talking on cell phones, not at all paying any attention to their flight path. After several near collisions, Carol began to deflect oncoming traffic around me. When Gord introduced me on Thursday night I told a story of how you never know it will go or what helpful insights bystanders will provide. Some can be encouraging and even provide decent criticism, but there are often as many comments right up there with "In the hole!" yelled out at a golf tournament. 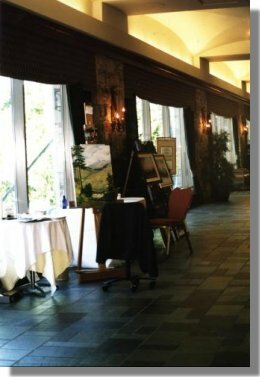 In July of this year, as in years past, I participated in Langley's Arts Alive event, which usually finds me painting live in front of Art and Frames Gallery. At the request of gallery owner, Murray Phillips, Langley painter Brian Croft and I usually do this event together. After an hour or so laying down an underpainting which was quite bold yellow, and purposely so, this older gent ambles along and, without humour, tells me "Too much yellow!" I told him to come back in an hour but I don't think he ever did. Of course, thereafter the Credit Union delegates were merciless with their own insights on the yellow content in the work. 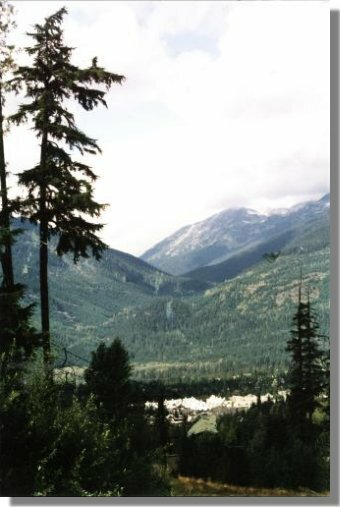 We arranged for a frame to be sent up to us, for an unveiling at the conference wind-up, held at the Adventure Ranch, in Pemberton. The delegates didn't know about this, nor had they seen the painting since the Friday. By 3 p.m. Saturday, it was 90 percent completed, so off we went to Pemberton for a grand suprise unveiling. The painting, entitled "Up and Down, at Whistler", was a success, and the standing ovation was incredible. It was done. 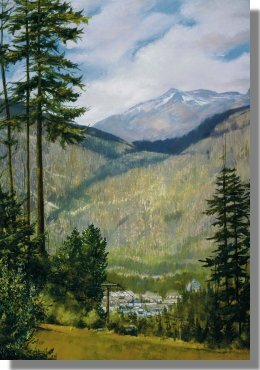 ... and landing in Pemberton, Saturday afternoon, September 21/02, with the painting unveiled. As the delegates wound up their conference with a western themed party, somewhat marked that we focused expression on my face had, for the first time in three days, finally relaxed into something resembling a smile. Possibly...there was certainly some sense of having successfully created a memory, for the credit union delegates, yes, but also for Carol and me. The painting came together in a way I hope more do... however, for this to happen, I will have to quit my day job, live in a posh hotel all expenses paid, be waited on, to have lots of attention, great food and atmosphere... I'm not holding my breath. I guess I will continue to produce new paintings in the usual fashion, in bits and pieces as time allows, between hockey games,dance and music recitals, church, work, time with family and friends; in other words, the same way I have for the past 25 years. So far, so good. By Saturday the morning the major structure of the painting was in place. The delegates hadn't seen the painting since late the previous afternoon, and they had already gone ahead to the Adventure Ranch in Pemberton, for the wind up bash. Rod had called from Charisma, and we had arranged to have a finished frame shipped up, and reveal the near-finished painting at Pemberton. The painting was finished with one final sitting in my studio on Monday morning, then delivered to Charisma Gallery for Rod Bishop to see the finished product. Thanks again to Rod and the gallery for the opportunity. The painting was then taken to Zheeclay Art Studio for proofing and printing. It is presently being reproduced into 35 limited edition prints. As I write this, the work is in process of proofing, printing, framing, and shipping. The original will hang in the Envision head office in Langley, and the prints go across Canada and United States. How good is that?